This is another gorgeous personalized Christmas stocking that reminds you of those grandma would make. Hand stitched Christmas tree fully decorated with mini beads, ornaments and other doo-dats. It is hand-embroidered with beads, sequins, and ribbon. and then machine embroidered with poinsettias. Elegantly done with shining thread. The Christmas tree is decorated with strings of beads sequins, and bows. The poinsettias are also embroidered with beads. Truly a beautiful and unique stocking! Personalized in embroidery. We personalize this stocking in little smaller font size as the space above the tree it bit smaller than regular stocking cuff. Measurements: The stocking is plenty big, about 19 1/2" diagonally and 8" wide. Materials: The stocking is made from ultra suede. Applique in velvet and and cotton, beads and ribbons. Lining: This stocking is lined inside with red linen. 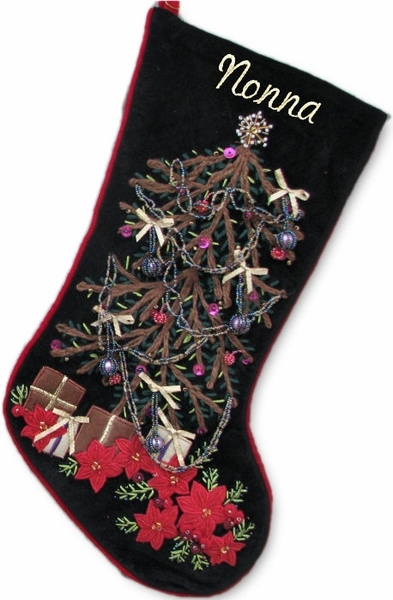 Names can be personalized on the velvet body of this Christmas stocking with GOLD, SILVER or WHITE or RED metallic embroidery thread to compliment the design of this Christmas stocking. This Old Fashioned design is available in Father Christmas and Hand Embroidered Tree so you can create a set decorating with similar items from the same designer collection. If the complimenting design still available, you will find it in the list of our Christmas stockings for sale. Each name is machine embroidered with the first letter in upper case and the remaining letters in lower case.